Opponents of Canada's seal hunt have a powerful ally in their bid to end the annual slaughter: Paul and Heather Mills McCartney, who took to the ice floes Thursday and frolicked with the doe-eyed pups just weeks before the harvest gets under way. The former Beatle and his wife arrived Wednesday night in Charolottetown, Prince Edward Island - a fishing village on Canada's Atlantic coast - and landed a helicopter on the ice in the Gulf of St. Lawrence on Thursday. The mission is to to put a white hot spotlight on the plight of the fluffy white pups, which are calved and weaned from their mothers on the frigid ice before being clubbed to death. It's a new cause for both McCartneys, although hardly out of character. The pop star, who three years ago used his clout to argue for better treatment of chickens, is a longtime advocate of the vegetarian lifestyle (won over by his late wife, Linda, early in their marriage) and has spoken out on environmental issues including the hole in the ozone layer. And Heather is an activist on behalf of landmine victims and the global campaign to ban landmines. The McCartneys, dressed in bright orange thermal jump suits, took helicopters with about a dozen journalists in tow to the ice floes just north west of Iles-de-la Madeleine, Quebec. They rolled on the ice with one pup and expressed sadness that it would likely be killed in several weeks when the hunt officially gets underway. "She's only three or four days old and they won't even get a chance to have a solid meal or even swim," said Heather Mills McCartney. "We've come out here to discuss the fate of these seals. In about three weeks time, these baby seals are due to be clubbed to death or shot. For many years people have tried to have this brutal practice stopped." The United States has banned Canadian seal products since 1972 and the European Union banned the white pelts of baby seals in 1983. The British government also is considering banning the import of seal goods. Groups such as Respect for Animals and the Humane Society of the United States, which are coordinating the McCartneys' visit, are encouraging people to boycott Canadian seafood as a show of solidarity. "I think the McCartneys are two of the most visible people in the world, and with them drawing attention to the fact that this hunt is still going on, this is going to get that message out across the world," said Rebecca Aldworth, who will be observing and documenting her seventh seal hunt for the Humane Society. Aldworth said the McCartneys quizzed her long and hard about the annual harvest, including the economic benefits that sealing brings to the local fishermen, whose livelihoods were devastated when Atlantic Ocean cod stocks dried up in the mid-1990s. 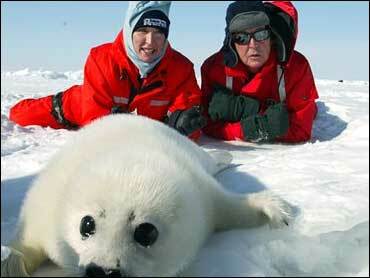 "I've observed the seal hunt at close range for seven years. I've routinely witnessed conscious seals dragged across the ice with boat hooks, wounded seals left to choke on their own blood, and seals being skinned alive," Aldworth said in a statement. "The commercial seal hunt is inherently cruel, it is a national disgrace." The Canadian government endorses the harvest as a cultural right for many Maritimers and announced a hunting management plan in 2003 with a quota of 975,000 seals over three years. About 325,000 seal pups were killed during the hunt last year, bringing the local fishermen $14.5 million (euro12 million) in supplemental income, which they say their families badly need during the winter offseason. The dates for the spring leg of the hunt have yet to be announced because the unseasonably mild temperatures in northeastern Canada have made the ice thin. Federal Fisheries Minister Loyola Hearn said Canada would not terminate the annual hunt and insisted it is the most regulated mammal harvest in the world. The government says the country's seal population is abundant, estimating there are 5 million harp seals. "I would encourage Mr. McCartney when he comes here to see the effect this is having on the economy and to realize this is sustaining people in their home communities," Hearn said. Aboriginal and Inuit subsistence and commercial hunters begin the kill Nov. 15 in Canada's vast expanse of frozen northern waters. The spring leg of the commercial hunt starts in the Gulf of St. Lawrence and moves to the Atlantic Ocean about 30-40 miles away from Newfoundland. Harp seals have been hunted commercially off Newfoundland since the early 1700s. They were first harvested for their oil but now are culled mostly for their pelts, sold mostly for the fashion industry in Norway, China and Russia.